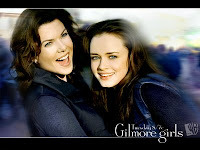 There are times when my mom and I are just a wee bit like Lorelai and Rory Gilmore, only with me in Lorelai's generation and my mom a generation or two before Emily's. And we live in much larger towns with much less family money and fewer diner meals, and aren't nearly as gorgeous, but I'm getting off-track. She just asked me on the phone, randomly, out of the middle of nowhere, "Do you know what year Judy Garland died? Don't look it up!" I guessed 1990. WAS I WRONG! Turns out we both thought poor ol' Judy had a lot longer life than she really did. Somewhere, over the rainbow indeed. I haven't checked yet to see if the answer's posted (guess it is, under the 'was I wrong' link). I guessed 1967 - I was born in 1966 and I knew that I never remembered her being alive. I was wrong, too.